Why Black Parents Should Teach Kids to Love Self! Not too long ago, I wrote a post: “When Will Black Lives Matter to Other Black People?,” in response to the killing of Tavin Rivers, 19, who lost his life over a pair of red, Chuck Taylor sneakers. His grieving mother, asked the very same question, as she languished over his lifeless body. Weekly, I’m increasingly reading articles in which this very valid question is asked. As horrible as it is for the killing of Black men by police officers, it’s even more heartbreaking for Black men to continually kill each other, in senseless crimes. In a recent Washington Post article, D.C. Council member LaRuby May (D-Ward 8) asked a similar profound question:”How do you make black lives matter to black people who have come to believe that they — and those who look like them — don’t matter?” In other words, how do you teach Black people to love self. Just asking this type of question shows the complexity of the problems that exist in some Black communities — problems that stem from a deeply-rooted existence of self-hatred. Yep, I said it; now, let’s deal with it! A love of self should be taught at an early age. This is a family value that is the responsibility of every Black parent, and impacts how children grow, learn, and interact with others in the world. Expecting a person to value the life of others, when they have no love for self, is like expecting a baby to run, when they haven’t learned to walk — it ain’t gonna happen without proper knowledge. When Will Black Lives Matter to Other Black People? When Jennifer Rivers, mother of slain victim Tavin, 19, lost her son over a pair of red, Chuck Taylor sneakers no one protested. Her son was just another victim of black-on-black crime. In a recent LA Times article titled: “A mother asks why some black lives don’t matter to other blacks,” this question is asked by the grieving Rivers, who can’t understand why black lives have little value to other blacks. A question that any grieving mother would ask after losing a child to such a senseless crime. Where is the public outcry, the protests, and condemnation, in support of the innocent lives lost daily in cities all across America? Don’t their lives matter too? Let’s be real: black-on-black crime is a serious issue we also need to address on a mass scale. Sure, we can argue that eliminating police brutality has greater priority, but we can’t ignore the statistics that homicide is the leading cause of death among young, black males, at the hands of another black male. Knowledge of Self is the Beginning of Knowledge! Since its origin, the word thug has referred to a criminal, mobster, gangster, badboy, or anyone involved in criminal activity, or roughneck behavior. The action or actions define the individual. For instance, any woman can have a child, but the actions of that woman define her as a mother, as in the case of Toya Graham. From the moment Tupac introduced ‘thuglife,’ the music industry and Black culture have embraced the label ‘thug’ as a street cred, or badge of honor. We watched as gangsta rap artists profited from the glorification of thuglife, while Black youth seemingly destined to live life on the frays of society, called each other the N-word or thug, as a term of endearment. During this time, we were silent. Now, Blacks are at a crossroad asking: “Where do we go from here?” As the debate continues about the use of the word thug, the real question is: “How do Blacks want to define and represent themselves to the rest of the world?” The answer to that question begins with knowledge of self! Where’s the Damn Reset Button? Today, the issues that impact Black youth: crime, drugs, police brutality, lack of jobs, limited access to quality healthcare and education are the norm and take center stage in the news. I don’t know about you, but I’m tired of hearing the same depressing news — never anything positive! If Black boys deserve a future, and they do, then it’s time to hit the damn reset button and bring about a new change! The issues I mentioned earlier shouldn’t be the norm to define the future life for our sons — they deserve better. Our sons should be hopeful and excited about their future, dreaming of one day becoming a doctor, scientist, professor, teacher, or CEO of a company. Notice that I didn’t say dreaming of one day becoming a rapper, or athlete? Not that there’s anything wrong with these professions. But, they shouldn’t serve as a carrot dangling before our sons, as if they can’t aspire to be anything else. God doesn’t change the condition of a people until they themselves change! Often, my writing has an in-your-face tone and style. I’m not apologizing — my writing is a reflection of who I am, and my upbringing. I grew up in the housing projects of Washington, DC, during the 60’s. I lived through the riots and civil unrest. I saw first-hand how the lack of employment and educational opportunities created hopelessness and despair. Thus, creating an environment filled with crime and drugs. When I became a mother of 3 sons, I not only feared that my sons wouldn’t have access to opportunities for success, but I feared for their safety. Unless you’re raising a black boy in America, you can’t understand that fear. I’d like to share that fear that I felt, day after day. Below is an essay I had written, but was unable to get published. It expresses my fear, as a Black mother raising sons. Sadly, the essay may never get published beyond this blog; editorial guidelines sometimes determine whether your voice is heard or not. Long before Trayvon Martin’s hoodie represented fear and intimidation; long before Eric Garner lay sprawled on the concrete, and gasped “I Can’t Breathe;” long before a chalk line traced Michael Brown’s bloody body in Ferguson; and, long before Tamir Rice lost his life while playing with a toy gun, I feared for my own sons’ safety. My fear, much like other Black mothers’ raising sons, didn’t just surface today. It’s the same fear shared by Black mothers raising sons from earlier generations. This fear, birthed from historical accounts of murdered black boys (Emmitt Till, Virgil Ware and Johnny Robinson), all early symbols of overzealous police and others, is branded into our subconscious minds. The heightened media coverage of recent incidents has given society at-large a glimpse into the persistent and hard-to-shake fear that Black mothers raising sons have always felt. On any urban street across the nation, black mothers cry out in pain, while holding the lifeless bodies of their sons, who have become victims of yet another senseless crime. When each of my sons was born, I made a commitment to do all within my power to protect them. This commitment included loving them, guiding, and finally helping them to navigate amidst negative influences in society. To whoever could hear, or would listen, I made my message loud and clear: “You Can’t Have My Sons!” I was prepared to go down fighting, or die trying. 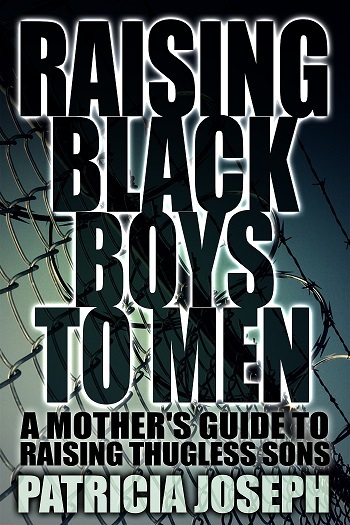 By far, raising Black boys in an urban area intensifies the fear – raising three sons increased my fear three-fold. The anxiety of raising my boys in several Philadelphia inner-city neighborhoods, strife with crime, violence, and drugs was enormous. With danger lurking on every corner, I was well aware that raising my sons in this environment meant that there were influences in my community, and in society waiting to devour them like sacrificial lambs. The moment one of them walked out the door, I began to worry. Even a trip to the neighborhood corner store could result in one or more of my sons becoming a victim of a drive-by shooting. Likewise, even their daily walk to school made them vulnerable to the advances of neighborhood drug dealers. And although my husband and I had raised our sons to have intelligence, good morals, respect for women, and themselves, I just wasn’t sure if this was enough to protect them. In my heart, I was always, always afraid for them. I fought hard to suppress the fear and pretended that I wasn’t worried, by telling myself “He’ll be ok.” After all, we raised him and his brothers’ right. Still, deep down inside I didn’t really believe those words. Prayers silently recited: “Oh God, protect my son and return him safely” gave comfort. Without faith in those prayers, I would have surely, slowly succumbed to that nagging anxiety of waiting for my sons to come home. As much as I longed to keep my sons protected from society’s ills – this was impossible. Knowing that I couldn’t watch them 24/7, I could only advise them to always do the right thing; a principle they could apply to every aspect of their lives. Once my boys became teenagers, I tried to prepare them for what they might encounter as they left home, by having “The Talk” –those words of wisdom on what to do if stopped by the police: show respect, keep your hands on the steering wheel, and most importantly don’t provoke – the goal is to leave the situation alive. Still, the uneasiness when darkness fell, and my sons hadn’t returned home, gave rise to anxiety, then fear. This fear, as it arose was much like a pot of slowly boiling water. Beginning as a thought, then growing to acute terror, the closer darkness overtook the day. Telling myself that ‘No news is good news’ helped with my anxiety, of not hearing from one of my sons, for several hours. Yet, when the phone rang, I prayed that bad news wasn’t waiting on the other end of the phone, upon answering it — feeling relief when it was only a family member or friend calling to see how I was doing. The moment all of my sons arrived home safely, I sighed, thankful that God had protected them another day. Although they arrived home safely that day, didn’t mean the fear had ended. It had just ended for that particular day. Trayvon Martin’s death seemed to mark the beginning of open season on young, Black men, in America. As such, I anticipated hearing the news of another mother losing a son. Today, my heart aches for all the mothers that have lost sons. The sad truth — the fear of losing a son is something we black mothers know — better than any other mother. Is Education the Key to Saving Our Sons? Black males are in crisis! Today, many are asking the question: “How do we save and uplift young, Black men?” Many believe that the answer to that question is education. Historically, Black males have lagged behind their counterparts, in educational achievement. Far too many lose interest in education, and end up not graduating from high school — this cycle must end! But, what’s the solution? BLACK LIVES MATTER, the fifth edition of the Schott 50 State Report on Public Education and Black Males addresses disparities in education, and provides a national, overview of the state of Black and Latino male students.